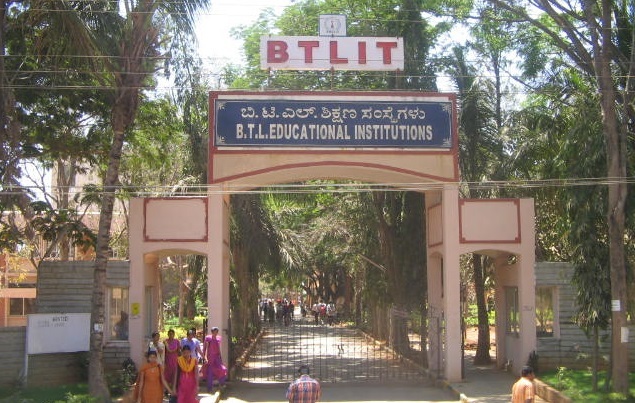 BTL Institute of Technology & Management is an institution dedicated to the cause of technical and management education. The institute was founded in the year 1997. It was established under the banner of BTL Educational Trust for Rural Development which was founded by Prof. B. T. Lakshman, an NRI settled in USA. The institute is located on the Hosur Main Road in Bommasandra, near the Electronic City. The institute is recognized by the Government of Karnataka and approved by the All India Council for Technical Education (AICTE), New Delhi. It is affiliated to the Visvesvaraya Technological University (VTU), Belgaum. The institute started functioning with the mission to impart quality technical education and instill a sense of discipline and dedication towards research and development activities in the upcoming areas of technology. The institute has a fleet of committed faculty members who guide the students and help them become competent engineers in the professional world. The campus of the institute is spread across 25 acres of lush green land. The campus provides a wonderful environment for learning. It has a large building that provides all the modern facilities for carrying on technical education. The campus is easily accessible from all parts of the city. To be eligible for admission to the under graduate programs in the BTL Institute of Technology & Management, a candidate must have obtained a minimum of 45% marks in Physics, Mathematics, Chemistry and Electronics or Computer Science at 10+2 level for general category or 40% for other reserved categories. To be eligible for Govt. CET seats minimum of seven years of study in Karnataka is compulsory. The training and placement cell of the BTL Institute of Technology & Management serves as a link between the Engineering graduates and the industry. It conducts technical workshops, seminars, and personality development programs, group discussions, written interviews and several other training programs for the students. The institute shares a campus connect program with Infosys. Through this program Infosys trains students on soft skills and personality development. Several renowned companies are recruiters of the college. Some of the renowned recruiters are Capgemini, Accenture, Sony Ericsson, VIT Infotech, L&T, HCL India, Tata Consultancy Services, Tech Mahindra, Infosys Technologies, Huawei Technologies, Wipro, Sonata Software and many others. The institute encourages research and development activities in the technical field. There is a Research and Development Cell in the institute that provides support to all research activities of the students. VTU has recognized the departments of Computer Science Engineering, Mechanical Engineering, Electronics & Communication Engineering and the department of Chemistry as research centres of the institute. Candidates can register for PhD & M.S. programs in the above mentioned departments. The institute has scholarship facilities for the students from the second year onwards. Scholarships are awarded based on merit. The institute has declared that two toppers from each branch will have a potential for a 6 months student scholar Exchange program at the University of Delaware, USA, with a purse of $1,000 per month.